The completion of the Regional Comprehensive Economic Partnership (RCEP) has been delayed once again to 2019. Nevertheless, leaders at the recently concluded ASEAN Summit noted that negotiations have advanced to the final stage. The RCEP encompasses 25 percent global gross domestic product (GDP), 45 percent of the total population, 30 percent of global income and 30 percent global trade. Led by the Association of Southeast Asian Nations (ASEAN), it is one of the most useful strategic opportunities for the 16 countries – ASEAN-10, India, China, Japan, South Korea, Australia and New Zealand – to realise an integrated regional economic agreement. The potential that the RCEP has is immense. 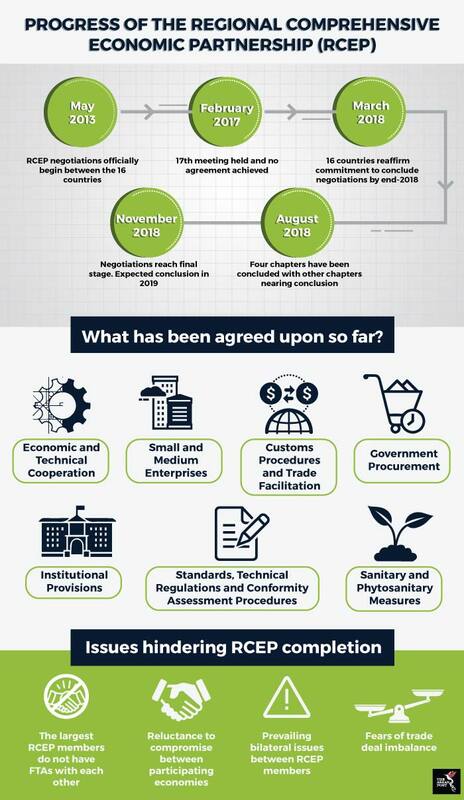 If completed, it stands to be the largest trade and investment agreement since the General Agreements on Tariffs and Trade (GATT) Uruguay Round in 1994 which established the World Trade Organisation (WTO). Ultimately, such a robust trade regime could lead to the grander aspiration of a Free Trade Area of the Asia-Pacific (FTAAP). One of the main factors hindering the RCEP’s early conclusion is India’s unwillingness to compromise on tariff lines. Lower tariffs could open up the country to foreign competitors who would flood its markets and likely derail New Delhi’s Make In India initiative. Make In India is a national manufacturing agenda created to transform India into a global design and manufacturing hub to boost the economy and create jobs. Signing the RCEP in its present structure would be ill-advised given that India’s elections are just around the corner and grim macroeconomic conditions would mean that New Delhi cannot afford to lose a significant revenue base from these tariffs. Already, the government is finding it difficult to boost the Make In India effort due to competition from Chinese manufacturing. China enjoys a manufacturing surplus and is known to dump its products across the world, including in India. India’s trade deficit with China in the 2017/18 fiscal year was US$63 billion – accounting for half of India’s trade deficit. Besides that, India is currently losing out to countries like Australia and New Zealand in the agriculture and dairy industry as well as the United States (US) in the pharmaceutical trade. The RCEP’s current form risks putting these industries in a more vulnerable situation, paving the way for global agricultural and pharmaceutical manufacturers to displace local players. Pushback has also surfaced from Malaysia. Under its new administration, the country intends to re-evaluate all trade deals negotiated by the previous government and RCEP has since entered its crosshairs. Malaysian Prime Minister, Dr Mahathir Mohamad said on the side-lines of the ASEAN Summit that his government will not sign any lopsided trade deal. This was in response to a report by the Malaysian National News Agency (BERNAMA) - citing an unnamed source – that if Malaysia feels that it isn’t getting a fair deal, it cannot possibly sign the trade deal by its latest 2019 deadline. The source added that one of Malaysia’s key concerns is market access. There cannot be too wide a gap with regards to differences in how much market access foreign players are afforded, the source said. Last September, Singaporean Prime Minister Lee Hsien Loong alluded to the completion of the trade deal by November this year after he mentioned that a conclusion to the RCEP is “finally in sight.” Now, having missed its fourth deadline, the momentous task at hand to push negotiations through now falls to ASEAN’s incoming chair, Thailand. Large scale trade agreements are not exactly popular with the Thais. In a statement last July, Thai civil society organisations urged their government to discontinue talks on the RCEP and another Asia Pacific trade deal, the Comprehensive and Progressive Agreement for Trans-Pacific Partnership (CPTPP). The trade deals were said to have a “severe impact to peoples and the society” and its negotiations which were shrouded in secrecy impeded meaningful participation from relevant stakeholders, only favouring large corporations and businesses. Nevertheless, compared to the CPTPP, the RCEP is relatively modest, prescribing lower and more limited regulatory standards. As most of the 16 participating economies are developing nations, this represents an opportunity that’s too valuable to be passed up. However, what must be kept in mind is the people’s welfare and interests. In hammering out such mammoth trade deals, it is far too often the case that large corporations and more advanced countries get the larger slice of the pie – most times at the expense of the interests of smaller nations. Who is actually leading the RCEP?